Orange indicates that VAW-E was observed and witnessed. Red indicates that although observers looked for VAW-E, no VAW-E was observed. Grey indicates no data was available. With this visual, we can see clearly that where observers are trained to recognize and report violence against women in elections, they do report it — an important indication that there is a wider picture of violence that we must all work to uncover. 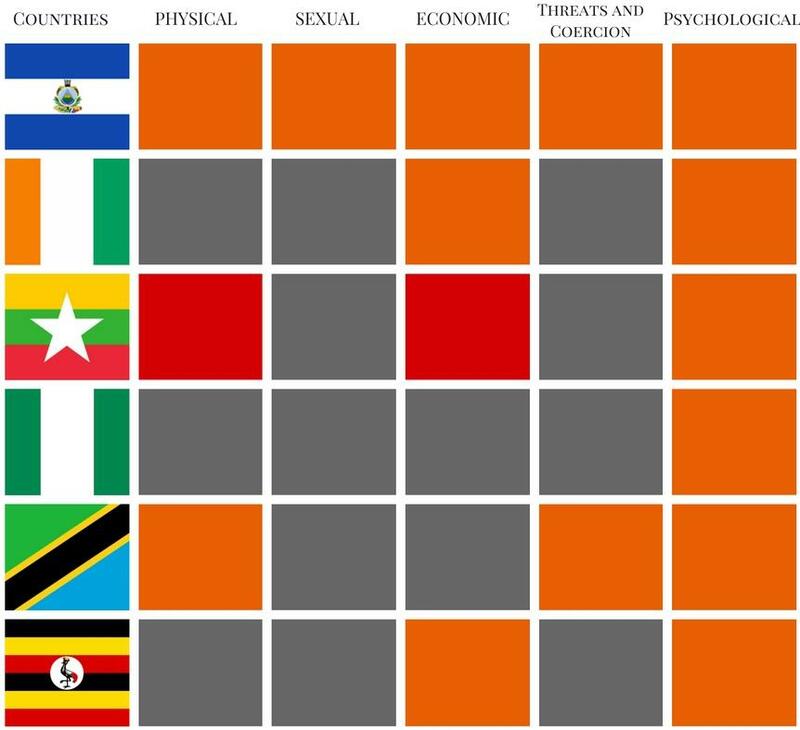 Note: The countries shown in this graphic are (top to bottom): Guatemala, Côte d'Ivoire, Myanmar, Nigeria, Tanzania and Uganda. Violence can affect women no matter what their role is: as activists, voters, candidates, election officials, party agents or observers. While men are also affected by electoral violence, women are differently or disproportionately impacted, even where the levels of violence targeting them may be lower. It is critical to look at the levels of violence against women as compared to men, and in addition, how that violence impacts women in their different roles during elections. This chart compares the overall observed percentages of victims by gender, providing a quick comparison between countries. Women face violence from many different actors, whether from opposition political parties or members and leaders of their own parties, from election officials, candidates or elected representatives, and even from their own family and community members. Observations should collect data on the common perpetrators of violence against women in elections. Importantly, perpetrators should not be assumed to be always men — women also have a role in perpetuating gender norms and perpetrating violence. Our data shows, however, that men are still the overwhelming majority of perpetrators, except for cases where observers indicated that both men and women were involved, or where no gender was noted. Women have a right to participate in any electoral role that is open to their fellow men. However, around the world, women are still underrepresented as voters, election officials, candidates and election observers. The Votes Without Violence project took a close look at the numbers of women that observers reported participating in elections in all capacities: overwhelmingly, women's participation levels still come in lower when compared to their fellow male citizens.